Its winter here and no time can go more appropriate to have a soothing heart warming soup which is more comforting and convenient to our souls.Soups by itself are simple to make and if I utter the very word makes my son happy and as always his type of soup would be either sweetcorn soup or vegetable clear soup,had a doubt whether he will have my carrot soup (recipe carrot soup) which he had not tasted anytime before,this is the first time making trial for me too!but he liked it and myself was happy that he liked it. Adding butter and cream is the best part in this soup because these two are the taste enhancers especially when you serve it for kids.If for adults with lots of diet concerns we cannot allow these kind of creamy stuff and while adding pepper you can very well add white pepper instead of black pepper,but personally I like to add only black pepper.Always add ginger in moderation otherwise the thing will be overpowering and it will not be pleasurable to have such soups.You can even add some onions before adding carrots to saute which gives flavor and thickness to the soup. 1.Grate carrots mince ginger and keep ready. 2.Keep a pan with butter add ginger and saute. 3.Then add carrots stir for some time adding salt and sugar. 4.Then add maida to it stir well ,add water and then pepper powder let it boil for two minutes(I added 2 cups of water)switch off. 5.Now strain it grind carrots by adding the same liquid. 6.Now again strain the content. 7.Bring to boil in the same kadai. 8.After one minute of slight boil switch off and add fresh cream and lemon juice. 9.While serving you can add more pepper powder and even adjust salt if needed. Grate carrots mince ginger and keep ready. Keep a pan with butter add ginger and saute. Then add carrots stir for some time adding salt and sugar. Then add maida to it stir well ,add water and then pepper powder let it boil for two minutes(I added 2 cups of water)switch off. Now strain it grind carrots by adding the same liquid. Now again strain the content. Bring to boil in the same kadai. After one minute of slight boil switch off and add fresh cream and lemon juice. For quick cooking I have added grated carrots you can add even cubed,chopped carrots but cooking time differs. You can adjust the thickness accordingly to your need. You can serve it with bread croutons or soup sticks. I have added maida to get thickness but you can avoid. Always check for salt at the end also and can add more pepper powder while serving. Adding sugar and butter enhances the taste of soup. 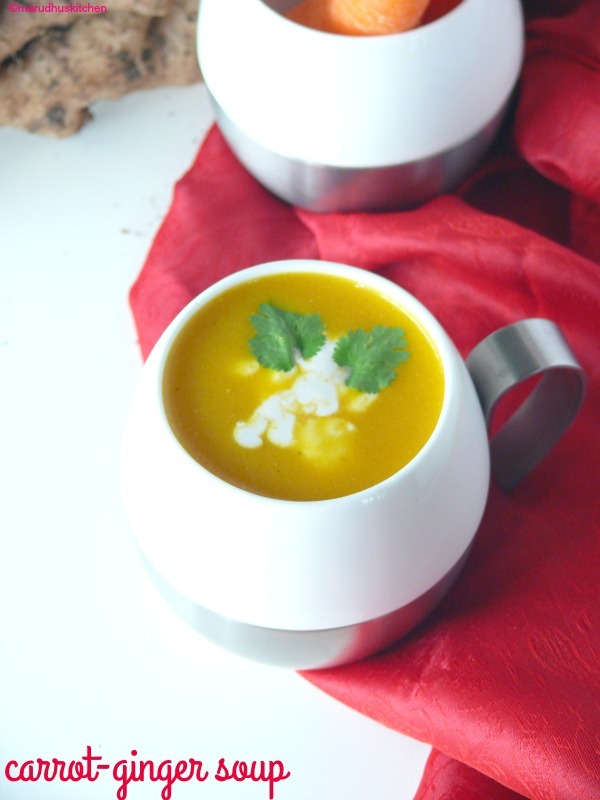 Beautiful Winter soup..will try it for sure. Lovely recipe and color. Beautiful presentation! That’s a great combination. My husband loves when carrot soup has ginger. Looks so appetizing! 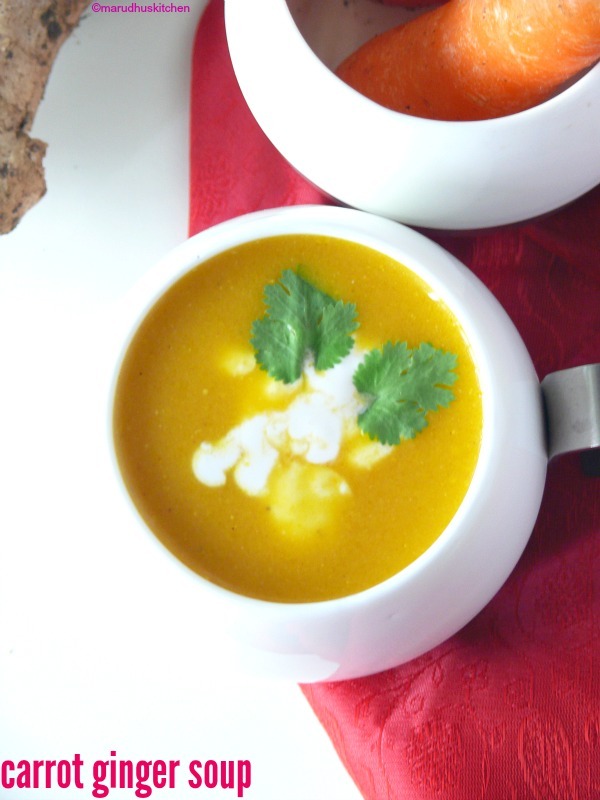 Love how delish, comfy and classic this soup looks. YUM!